The starting point is poor strategy implementation: What has been decided and agreed is not being delivered! Here is why strategy implementation usually fails – and 6 design principles that will fix the problem. This article is stand-alone, but I still recommend you to first read this one on Strategy and the Proper Use of M&A. So about strategy … exactly what is it? Using this definition, the initial action point is to remove the irrelevant content and trivialities of most strategy and business development plans and to start over – with lasting competitiveness as the key ingredient. However, the root causes behind poor strategy implementation include not only a lack of sharp strategy definition, but also insufficient ability to design strategy processes that deliver value. Basically all modern “ways to compete” are cross-functional, whereas our organizational mechanisms are usually not! Consequently, the processes of strategy development and strategy implementation need to mix functional skills with cross-organizational structures and boundaries, which, beside the mechanisms of “implementing change”, are the key reasons why new strategies are tricky to realize. The second action point, therefore, is to attack head-on the profound reasons why “change” does not miraculously transform itself into the “integrated set of actions” which will comprise the core of the strategic plan. 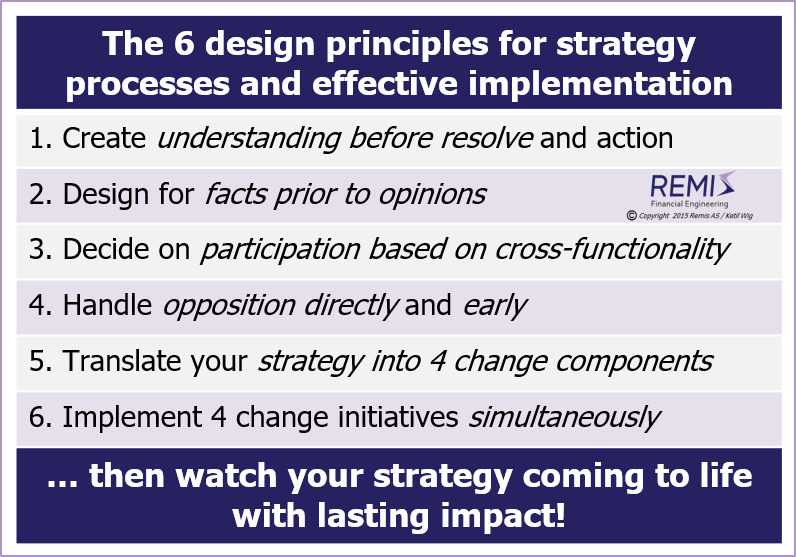 Introducing the 6 strategy process design principles for delivering results! The starting point is poor implementation: What has been decided and agreed is not being delivered! Acknowledgement of these simple but deep observations has profound consequences for process design – e.g., how information is distributed, to whom and at what time – and the extent to which facts are used to establish and communicate the basis for change. The second principle for improving implementation comes from the field of group dynamics. Most projects assemble participants in task groups. The problem that emerges is low group performance due to fundamental personality differences. The consequence of these personality differences in a strategy team is a composite of three to four totally different approaches to problem solving – which does not work in terms of facilitating a productive work environment. Process quality and productivity strongly benefits from this phase design, but it necessitates discipline: The solutions and action plans are not on the agenda until phase three. The importance of this process design is typically higher the more controversial the issues on the table; e.g., synergies, personnel policies, etc. Basically, all ways to compete in the present post-industrial society (e.g., speed of innovation, technological leadership, logistics/deliverability, cost leadership, customer service, quality, etc.) require coordinated action plans involving a large number of functional areas of the business. Managers are typically not sufficiently aware of the profound consequences of this fact. Consequently, when designing a new innovation strategy, a broad and interlinked set of functions need to participate in the solution design and action plan development. All task groups should systematically be staffed by both supporters and opponents. Opposition sharpens the quality of arguments and it does so earlier in the process. Resistance to change is predictable noise. In a typical population of 100 there will be 15-20 skeptics, 3-4 strongly opinionated opponents and (among those) at least one "fanatic". Opposing forces are always present, and it is far better to process these individuals proactively and early on – than to wait and being forced to handle the opposition during the execution phase. Have you ever asked yourself what realizing change really is all about? An uncomfortable question maybe? Interestingly, change management is a cloud of fuzziness created by management consultants – most of whom cannot offer a precise description of what their approach to “change” contains. Illustration 2: From Strategy to Implementation – A model for "Making it Happen"
The sixth principle reflects the necessity of setting the above mentioned change tools in motion simultaneously. Applying the same tools gradually and sequentially does not work. The reason for this non-obvious conclusion is that all change involves resistance, and these four tools meet these obstructions in a systematic way on multiple levels. You need a critical mass of measures in order to overcome the resistance, and a simultaneous approach gets the job done! Without a keen awareness that all change is about putting these four tools into coordinated motion, the implementation of a new strategy will, in all likelihood, result in little more than good intentions. Many organizations are disrespectful of new strategic initiatives, usually due to prior experiences with a lack of management’s ability to implement the decisions of previous initiatives. Strategy should be a plan for improving sustainable competitive advantages. Focus on exactly that! Then watch your strategy coming to life with lasting impact! For a full pdf version of this article, see White Paper #3: Strategy and Implementation ... and the Lack of Results. Also read the separate article on Developing High Quality Business Models; on M&A strategy, on Strategic Alliances and Joint Ventures, on Buy-Side M&A, on Sell-Side M&A, on Synergies and Poor Judgment, on Financial vs. Industrial Ownership and about M&A Process Management. See Download Center: White Paper #1: Post-Merger Integrations - About Synergies and Poor Judgment; White Paper #2: Strategy - and the Proper Use of M&A Tools. A LinkedIn article with a shorter web version of the same white paper is available here; White Paper #5: Buy-Side M&A (mergers and acquisitions); White Paper #6: Sell-Side M&A (divestitures, trade-sales and mergers); or White Paper #7: Should You Choose Financial or Industrial Investors/Owners?. Remis AS and Ketil Wig offers financial advisory and consulting services to foreign owners, handling key priorities related to investments and operational assets in Norway. Typical M&A assignments are related to handling acquisitions, mergers, business partner searches (e.g. for strategic alliances or joint venture solutions) or divestitures/trade sales. 100+ executed acquisitions, divestitures/trade-sales and merger/de-merger/joint venture projects. Focus on managing acquisition risk, negotiations, tactics and maximizing value. Business unit size of US$10-250M, with deal sizes up to 2x these levels.